What do Jo Malone, Cath Kidston, Maggie Smith, Olivia Newton-John, Jenni Murray and Kylie Minogue have in common? They have all been diagnosed with primary breast cancer. We talk about ‘breast cancer’ as if it is one disease. It isn’t. There are several types of breast cancer which grow in different parts of the breast and at different rates. Some of us will be given chemotherapy, some of us won’t. Some women have mastectomies, others have lumpectomies. Many - but not all us - have radiotherapy. I felt a fraud when I didn’t have a mastectomy for a rare, aggressive breast cancer - but at least I got to keep my breast (someone really did say that by the way). Whatever our treatment, what really matters to the 57,000 or so people diagnosed with breast cancer in the UK is that we don’t have, or develop, secondary breast cancer. Unlike primary breast cancer, which hasn’t spread beyond the breast or glands under the arm, secondary breast cancer refers to breast cancer which has spread to other parts of the body through the lymphatic or blood system. You might hear it described as ‘advanced breast cancer’, ‘metastatic’, or stage 4 breast cancer. You might also hear about so-and-so who had breast cancer and then developed liver cancer. This is inaccurate - breast cancer that has spread to the liver is not the same as liver cancer. 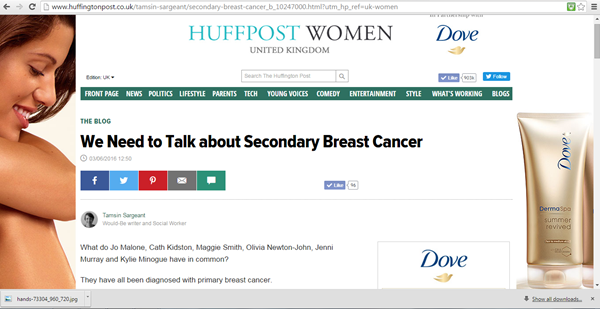 The good news is that secondary breast cancer can be treated. The bad news is that it can’t be cured. Treatment aims to slow down the spread of disease, to relieve symptoms and give the best possible quality of life, for as long as possible. Once the initial shock of a cancer diagnosis has receded, for most of us, the gruelling treatments, disfiguring surgery and psychological effects seem like a small price to pay for our lives. The end of ‘active’ treatment (chemotherapy and/or surgery and/or radiation) feels a bit like graduation - we get our big send-off and party. Everyone loves us because we took on cancer, because by being brave and positive we ‘beat’ cancer. Of course we want to finish our treatment with optimism and celebrate being cancer free. If we are lucky, we pass the first year with a clear scan, then after the second we begin hoping we’ll reach the five and ten year milestones. How much attention do we give to secondary breast cancer? It’s easier to return to denial - this is our way of ‘moving on’. We wear our positivity as though it is a talisman which wards off cancer, as if it’s a well-established fact that by thinking about cancer we might activate some tiny cell into action, putting our lives in peril. We try not to think about cancer, we try to forget. Then we get a niggle, a pain, a scan. That old friend, Fear, knocks on the door again. Are we quite as safe as we think we are? As a woman diagnosed with breast cancer twice, I get a knot in my stomach just typing the words, ‘secondary breast cancer.’ I admit that I’m haunted by the possibility of cancer returning. It’s the sun and moon of all my fears - as inescapable as the day and night, yet unspoken. Around 30% of women go on to develop secondary breast cancer - these women are mothers, sisters, daughters, friends and partners. It’s the not-so-pink lining which we women with primary breast cancer can hardly bear to face. But what happens when our friends are diagnosed with secondary breast cancer? I was diagnosed with secondary breast cancer in 2015, 9 years after having been given the 'all clear.' I see women extremely saddened when the friends they have made throughout their initial treatments or through support groups are diagnosed with secondary breast cancer. Though they continue to offer support, for many, this understandably means their own anxieties surface and they begin questioning their own mortality again. Having been there myself, I know this can be hard, especially when you are gaining a sense of moving on. But, this reaction can make it difficult for those of us with secondaries to feel that we belong in the general breast cancer community where the focal discussion inclines towards treatment for primary cancer and its aftermath. The sense of maintaining a positive attitude to ‘beat’ it, can be a challenging theme for those who haven’t been so ‘fortunate’ to keep it at bay. This fear which secondaries sparks in others means we find solace in groups specifically for secondary breast cancer but this then means the whole community doesn’t really talk about it. Somewhere along the way, I’ve realised I need to face my survivor’s guilt, sadness and the fear that I too might develop secondary breast cancer. People think that positive-thinking 'beats' cancer. It doesn’t. A cure will only be found by better understanding what makes our cells grow uncontrollably and invade distant organs. We desperately need science to find out why it is that some women find out that their cancer has returned, despite extensive treatment, despite having been told they were ‘all clear.’ We can only do this if we stop hiding and start talking about secondary breast cancer. The more we talk, the more likely it is that we can support one another and the more likely it is that we can press for better and more effective treatments. "How does breast cancer do that? How do cells escape from an original tumor and nest somewhere in the body, eluding all treatments thrown at the disease and mysteriously "wake up" and start moving around the body again fifteen years later? What gives them the ability to hide? What triggers their activation again? What makes them so resistant to treatments? Why can't they be stopped? How do we know who has had breakaway cells versus those who haven't? We don't know. Nor do we even know the exact number of people with early stage breast cancer who go on to develop secondary breast cancer". I dedicate this blog to Vicky, Amanda, Shelly, Rachel, Uzma and anyone living with a recurrence or secondary breast cancer. Even though you won’t recognise their names, these women are no less worthy of our attention and celebration.